I know I've been missing in action for the longest time possible. That is because I do not have any time in hand at all. Just a slight update of my life currently. I am no longer in service with Federation of Malaysian Manufacturers. I've moved on to a new company and even though it still needs a little of fitting in. I think I will be fine in the coming months. I deeply appreciate to those that has gave me all the support and all those great advise during my one and a half years service with my previous company and I will never forget the great things that everyone has taught me. I am now tied with a pharmaceutical company never in my life that I thought I would ever go into this line. Challenging? Yes it is. Hard work? Damn right it is. But since I've already made the commitment to take up this job opportunity, I'm going to work hard towards it. Apart from that, I am also a Body Combat instructor!!!! Woohooooooooooo!!!! Thanks to my mentors that has been giving me harsh feedback and guidance, and also not forgetting my Mr.G for all the support(even though the things that he says at times doesn't make sense at all). I thank you all. I still have a very very very long way to go and I will not give up just like that. 1. To be more motivated in my career. 2. To enhance on what ever skills that I possess. 4. To tone up my existing body shape. I think that’s about it for the year 2013. As you can see, nothing much of buying something for myself or any superficial stuff. I just want a peaceful and smooth going 2013. I don’t want big bang with fire crackers and anything fancy because I’m getting quite old for all these. Suppose to include in Indonesia but because I was down with H1N1, I had to cancel the trip 1 day before I fly (bummer). I’ve also worked in Federation of Malaysian Manufacturers for approximately 1 year and 3 months so far and things has been going not too bad. Very smooth and I couldn’t ask for a bunch of better colleagues. I’ve also joined gym just to spend more time with Mr. Damien Lee as most of the time he would need to travel from gym to gym to replace / conduct classes. I’ve basically transformed into his puppy which will be following anywhere that he is going. No complains though. I get to maintain my weight while still enjoying what I like (in terms of food). However I had lesser time to spend with myself because of the hectic travelling these days. Not to mentioned I spent a lot of money on clothes, food, and workout stuff. Despite all that, 2012 has been good to me; but I am grateful that it is over now because I can focus on a brand new year. Bring it on, the year of Snake! Let me share some of the photos that I missed out previously. Myanmar business trip last 2012. One of the delegates that went to Myanmar with us. The very fun gang of businessmen. Bangkok 2012: The missed out graduation trip. After returning from Bangkok, I really do look like a Thai girl because the sun was so strong that I had a free sun-tanned session! Hong Kong, Macau & Shen Zhen family trip. These are just some of the shots that I’ve missed out blogging about it and I hope that you enjoy piece and pieces of my year end 2012. To round things off. Here’s one with my ever famous Teddie. I know I have not been updating my post for quite some time and it is because I'm having a very hectic schedule of hopping from one gym to another. Balancing in work and relationship and also maintaining a healthy lifestyle too. Thanks to those that has been so caring to during my H1N1 stage and I can say that I'm all healthy again. It was my birthday yesterday and I did had a wonderful celebration with my colleagues, gym mates, family, and also my naughty little baby. As seen from my Facebook, I had a surprise from him. A nice bunch of peach colored roses. 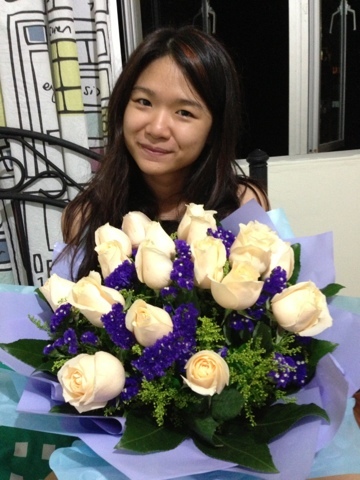 Last year, he sent it to my office, with a note saying he is sorry that he couldn't be with me during my birthday. This year, with a bigger set of flower, with no note, but a sincere set of face saying that he appreciate me for who I am. Thanks for being there for me no matter how bitchy I was.
" BELIEVE and TRUST "